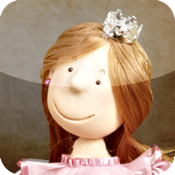 Doll Play books are interactive app book with clay art based on World's famous story. Appreciate the frog prince Fairy Tales which has been liked and beloved by the children around the world with 3D puppet show of listening, touching and recording. 1. You can move it by touching the appeared characters and various factors. 2. You will be immersed into the fairy tales as it was directly recorded by the professional voice actors. 3. It has an interest for the children to find the diversified hidden flash effect out of the dram. 4. It is available to read the book with the voice of mother or father by using the recording function. The children may concentrate to the fairy tales if it is heard by the parents' voice and it will be a great help to form the emotional satisfaction or familiarity with the children. 5. It helps the English education of the children by solving the various types of quiz owing to the addition of education function. When the father who did not read the book and had difficulties to be familiarized with the children as he was busy utilizes the recording function, the children will be closer to the father as they can listen the father's voice everyday and it helps to create the familiarity with the children. In addition, make the children record on it!! They will think it as mysterious and delighted when they listen own voices. The vocabulary power will be improved while they read and record following the script. First of all, select the language mode for listening. Set any of the English, Korean, Japanese and My voice. Next, set the Auto-play and Touch-play. The characters move according to the story automatically in Auto-play. The characters react and move in Touch-play. The fairy tales are started when the play button is pressed once the setting is made. It skips to the page for recording when the voice record button is pressed. Record by pressing the page button for recording out of the list, otherwise record from page 1 to the last page one by one. Finish the recording before the blue line on the right to pass over to the end of red line. Press the play button after setting to the My voice at the narration setting when the recording is finished.